Homeland Security Secretary Janet Napolitano told NewsHour senior correspondent Ray Suarez on Friday that cyber attacks on the United States are on the rise, and internationally, three countries are the biggest sources: Iran, Russia and China. The interview with Napolitano airs on Friday’s broadcast. “It’s a big problem and it’s been growing in frequency and sophistication in the four plus years I’ve been secretary,” said Napolitano. The threats can be anything from “hacktivists” to state actors either trying to steal the United States’ innovative ideas or simply do harm, she said. In an effort to protect the nation’s infrastructure, including electricity grids, telecommunications networks and water supplies, from cyber menace, President Obama signed an executive order Tuesday that directs government agencies to come up with a set of voluntary security standards that companies in charge of the infrastructure can adopt. Certain lawmakers and some in the business community, including the U.S. Chamber of Commerce, oppose the directive, saying it is unnecessary and could lead to the tightening of regulations. The executive order says the agencies must determine if they have the existing authority to establish requirements based on the new standards, or if they need to get any new authority to do so. 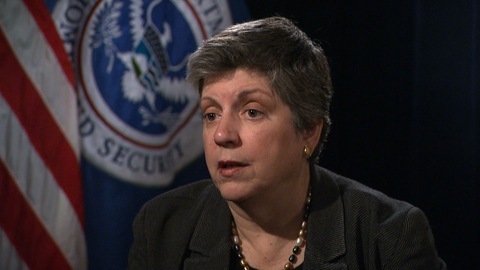 Napolitano said some don’t realize the seriousness of the threat. “A lot of times you say ‘cyber’ and I see people’s eyes glaze over. “We are so networked, interlinked as a world now, (and) that networking gives multiple avenues of opportunity for terrorists or others who seek to do us harm, steal our intellectual property for huge economic gain, interrupt our daily way of life. 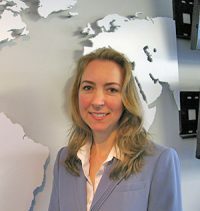 So our job is to work as best we can, using all the resources at our disposal to prevent that from happening,” she said. National cybersecurity center in Arlington, Va. Photo by Daniel Sagalyn/NewsHour. The Department of Homeland Security’s National Cybersecurity and Communications Integration Center in Arlington, Va., is the epicenter where the increased sharing of information between the government and private sector will take place. 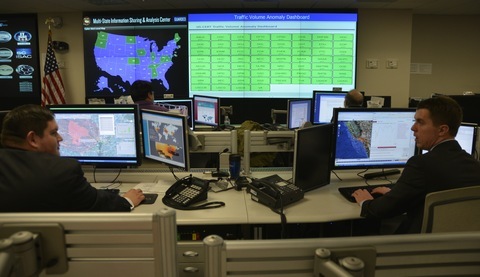 The facility, which includes 70 computer stations positioned in front of large screens of digital information, has a rotating staff that monitors the health of computer networks around the country 24 hours a day, seven days a week. A large map of the United States shows the individual states as blue if their Internet traffic is behaving normally. If sensors on their networks detect a particularly high level of computer viruses being sent via email or the Internet, the states appear green. A recent visit showed 11 in this condition. State governments that have opted into the monitoring have liaisons at the center who can work on the problem. One of the effects of the new executive order will be to expedite the issuance of security clearances, said the center’s director Larry Zelvin. That way, more people can access the government’s classified and unclassified material to identify when a system is under attack and be able to fix it.